Reading this passage about God’s great feast, I think of the Thanksgiving and Christmas dinners I have known. (The closest thing to a feast that I have ever really experienced.) We pull out the nicer table cloth. We put up the special decorations and carefully make up the centerpiece. The good silverware is brought out and polished up for the occasion, along with the china plates and fancy glasses and tea cups (or coffee mugs). The food is unique too: turkey cooked for hours to make it tender. Veggies, mashed potatoes, gravy, stuffing, rolls-the table is loaded. And special drinks: wine for those who like it, sparkling cider for those who don’t. Also a separate glass of water, and coffee, tea, or hot chocolate after dinner. And the desserts! Pumpkin and apple pies, fudge, cookies of various sorts-no one thinks less of you for having that extra slice of pie or piece of fudge. And if it is Christmas, the gifts. 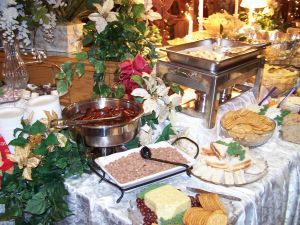 Here we discover that God likes parties too, and is putting out the fine china, loading the table with food much better than even our once or twice a year delicacies, and lighting the candles for that special ambiance. He is putting gifts out too. I am suddenly struck with an amazing thought: we put our presents under a tree decorated especially for this once a year celebration. His gifts come in the shadow of a tree as well, but this time the only thing hung on it is the broken, mangled body of the Son of God. And His gifts are different too, “reverse gifts” if you like. He gives by taking-death is removed forever, and all tears taken away from His family’s eyes. Shame and disgrace are likewise banished forever. As people, we hate being away from our families during the holidays. Not being home for Christmas is thought a sad and very difficult thing, and missing thanksgiving dinner only slightly less so. How much more tragic would it be to miss God’s special meal? “…the best of meats and the finest of wines” left untasted, the gifts so costly left unopened below that special tree. God promises to give His reverse-gifts to His family from all nations and peoples. This is why we are missionaries. We are all about inviting people to the party. The holiday table is also a place of reunion and sharing; family members come home from far places. Stories, updates, and memories are share-not only experiences of the past year, but remembrances of times past. The fellowship at God’s table will be magnificent, and the stories amazing-and who knows what tales and remembrances Dad will share? The date set for this feast, while unknown, is rapidly approaching. We need to dress up in our holiday attire-His holiness and grace-and phone, text, or e-mail all of our friends, inviting them to the feast. This entry was posted in Journal musings and tagged Christmas dinner, feast, food, God, holiday, holidays, Isaiah, Thanksgiving, Thanksgiving dinner, turkey by Susie. Bookmark the permalink.